1 Market Hill, Halstead, Essex, CO9 2AR. Telephone: 01787-477222. 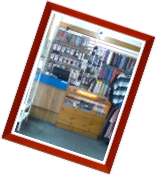 Hardys Menswear supply a large range of clothing for all occasions from many well known manufacturers such as Anatomic, Azor, Baileys, Barrutti, Bowns, Casa Moda, Culture. Double Two, Douglas, Franco Ponti, Ikon, Irelands Eye, Loake, Meyer, Olney, Olymp, Peter Gribby, Remus, Seidensticker, Scott, Sloggi, The Label & Venti. We also offer Evening Suit and Lounge Suit Hire from a large stock held on the premises and we are agents, for Wedding Hire, with Peter Posh a well known and respected Hire Company.